The Leighton Town board will wait and see what happens before making a decision to bring in a new manager following the departure of boss Paul Burgess last week. 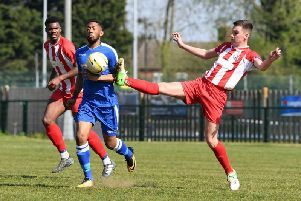 The Town boss left his post following the 3-0 defeat to Berkhamstead last weekend after taking over at the beginning of the season. Former boss Sean Downey, who also returned to the club in the summer as part of Burgess’ backroom staff, took over at the helm for Town’s 5-3 defeat to Oxhey Jets. His position though might not be for the long term as the club intend to make a decision over the future of the manager in forthcoming games. Burgess’ departure came as a result of having to juggle working full time, running his own business, as well as managing the club. And with Town toiling in 19th place in SSML Premier Division, Burgess felt it better to walk away from the club. A club statement read: “Paul has agonised over the decision but has found it increasingly difficult to run his own business and find the time to meet the significant demands of his role at the club. Paul, who was in his third spell with the club, is very disappointed to be leaving but feels that it is unavoidable given the increasing demands of his business. “Paul leaves with the sincere thanks of all at Leighton Town FC for his commitment and hard work this season.